Home » Blog » 5 reasons to look forward to Bike Camp this summer! 5 reasons to look forward to Bike Camp this summer! 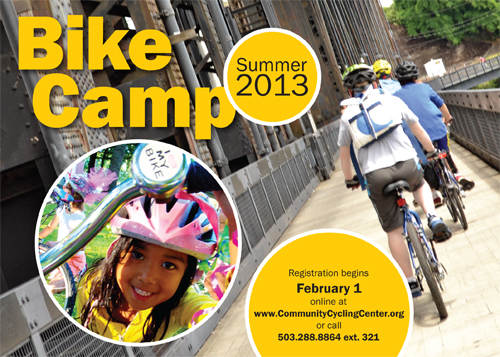 Online Registration for Bike Camp opens February 1st! In the off season we held several focus groups with both campers and their trusted adults to find out what is working and what we can improve. Based on their feedback, we developed two brand new camps: the Food Cart Freewheelers Camp, and Mechanics Camp. In Food Cart Freewheelers, middle schoolers broaden their understanding of both cycling and cuisine. In Mechanics Camp, high schoolers will learn bike maintenance from a professional mechanic at our bike shop. This year, we are happy to offer a wide range of Bike Camps for campers in grades 1 – 12. Bike Camp has been the shiniest spoke of Portland’s summer recreation wheel for over a decade. During this time, Bike Camp waves kids home happy and exhausted at the end of the day. In the midst of constant tinkering to improve the program, we hold onto our beloved traditions such as Friday’s bicycle-delivered popsicles and helping kids earn a bike tool or accessory during the week. We believe all kids should have access to Bike Camp. That’s why we offer scholarship to qualifying families. This year we’ve saved 12 spots in our camp for kids who wouldn’t be able to attend without some help. Two kids will also receive bikes along with their discounted rate for camp! Our campers learn the skills they need to become life-long cyclists. Through hands-on, experiential learning, kids and young adults learn bike safety, hand signaling, route planning, and riding skills. Campers bring the passion and knowledge home to their families to share and grow our cycling community. Check out all our fun 2013 Camps on our webpage, and register February 1st!